Sign the Petition for Your Right to Work! 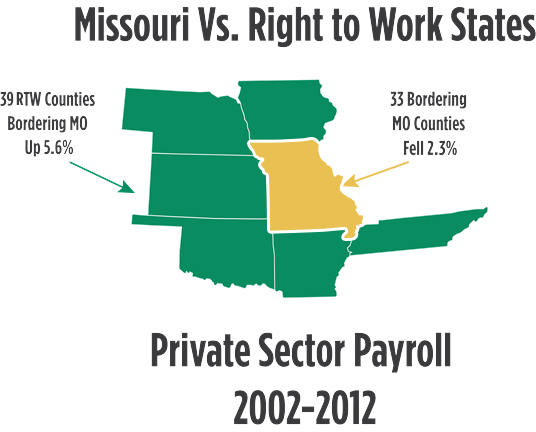 Right to Work means more freedom, more choices, and more jobs for Missouri workers. Support right to work in Missouri by signing our petition below. Between 2000 and 2011, Right to Work states saw an increase of 11.3% in the number of residents between 25 and 34 years old- almost 19 times the increase in forced-union states. Americans for Prosperity supports the effort to create jobs and advance personal freedom in Missouri. Do you? Sign this petition to have your voice heard and that you want jobs in Missouri! Sign this petition to have your voice heard and say that you want jobs in Missouri! What happens when I sign a petition?